Araneta Center, Inc. is the owner, developer and manager of the Araneta Center. 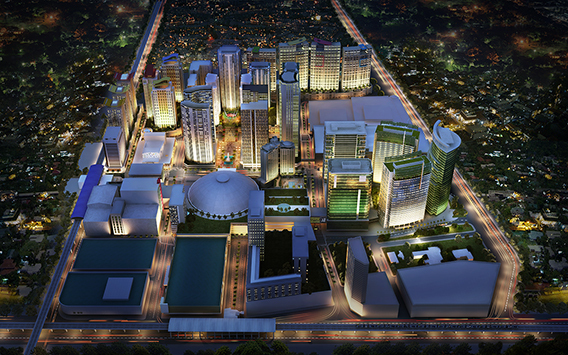 Built and developed on a 35-hectare (90 acre) property right at the heart of Metro Manila, The Araneta Center is a hub of retail, entertainment, residential, hospitality, and office developments that sees an estimated 1,000,000 visitors daily. It straddles the crossroads of two major roadways, EDSA and Aurora Boulevard, giving visitors an unparalleled access to the North-South and East-West corridors of Metro Manila. It also provides commuters a strategic link between two major train systems, the MRT-3 and LRT-2. Today, the Center has 2,108 tenants in over 1.1 million square meters of shopping area. Its current count of 20,000 BPO employees is projected to rise to 100,000 in the next few years with eight hectares primed for high-tech office spaces for technology-based companies. 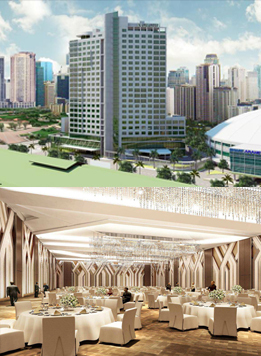 With the opening of Novotel Manila in the last quarter of 2015, the Center now offers 400 hotel rooms to leisure-seekers, and business clientele that can also avail of its 1,000-capacity ballroom and other function rooms.Ten out of 18 residential high-rise towers have now been built at the Center. The Manhattan Residences will provide an estimated 9,000 units upon completion, which will be home to over 36,000 residents. On the axis of all these developments is the 20,000- seater Smart Araneta Coliseum, the country iconic sports and entertainment mecca. Serving attendees of local and international events are 7,000 parking spaces that include those in the Parking Garage South. 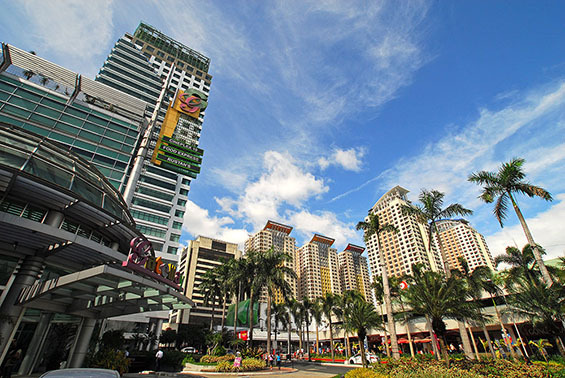 The Araneta Center is in the midst of an extreme transformation towards mixed-use real estate development in a transit-oriented commercial, office and residential district. Patterned after a lush “garden city” environment, it aims to attract a wide range of visitors that will enjoy various activities in the Center. Integral to its development is an information technology backbone that would best serve the needs of tech companies and business process outsourcing firms. With this master plan, Arantea Center will become an ultimate lifestyle destination that is striking, vibrant and alive with 24-hour activities. It also cements its mark among commercial and business developments in the country, and is instrumental in the consistent growth of Quezon City, the largest and most populated city in Metro Manila with an estimated 55% belonging to the mid-to-upper market. It also cements its mark among commercial and business developments in the country, and is instrumental in the consistent growth of Quezon City, the largest and most populated city in Metro Manila with an estimated 55% belonging to the mid- to-upper market. The flagship mall that sparked the renaissance of the Araneta Center, Gateway Mall was hailed as Shopping Center of the Year in 2006 and 2007 by the Philippine Retailers Association. It was also a Merit Awardee at the International Council of Shopping Centers (ICSC) 30th Innovative Design and Development Awards, and a finalist at the 2008 Urban Land Institute Awards for Excellence. Anchored by Rustan’s Department Store, Gateway Mall has five levels of the finest in shopping, dining, fashion, services, and entertainment shops, with three levels of basement parking. It has a total floor area of 100,000 square meters, and caters to about 220,000 shoppers every day. 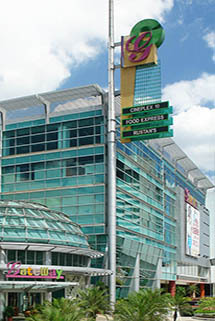 The mall is linked to the Coliseum by a walkway, and to the two major transit systems, the MRT-3 and LRT-2. Opened to the public on June 30, 1976, Ali Mall was named after boxing legend Muhammad Ali, who came out victorious in the 1975 “Thrilla in Manila” bout against Joe Frazier at the historic Araneta Coliseum. Muhammad Ali returned to the country a year after the fight as guest of honor during the mall's inauguration. The Philippines first enclosed and fully airconditioned mall, it boasted many firsts: It housed the first Cineplex with two initial cinemas that later became four upon mall expansion; had the largest indoor skating rink at the time, the widely successful Skatetown; and pioneered the concept of the food court. Known to be the first and then the only integrated shopping and parking complex in the Philippines, Ali Mall changed the shopping experience by putting a premium on customer comfort and convenience. Forty years later, a redeveloped Ali Mall now carries a wider variety of shopping and dining choices, environment-friendly air-conditioning, and a stadium-seating, state-of-the-art Cineplex. It features a one-stop government and banking center, and now has a retail pedestrian link to the SM Department store lined with cafes and food kiosks. Araneta Center’s gateway to EDSA, the newly renovated Farmers Plaza has a modernized facade, upgraded facilities and amenities, and enhanced security to ensure customer safety. 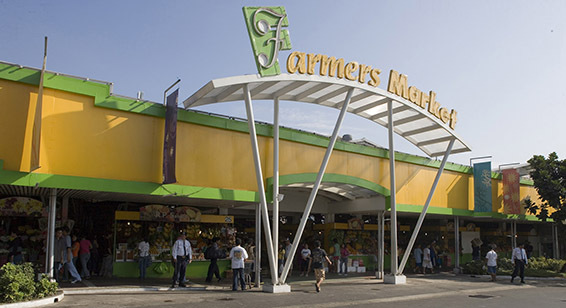 Its highlight is the newly opened Farmers Plaza Bazaar, a beacon to bargain-hunters. With the EDSA-MRT station directly connected to the plaza’s shopping concourse, it offers utmost comfort and convenience to shoppers from all over the metropolis. In August 2012, this weather-proof, state-of-theart parking facility opened right beside the Smart Araneta Coliseum. The Araneta Center Parking Garage South features five floors aboveground and three basement levels of luxurious parking for 1,500 vehicles. The Gateway Tower is a PEZA-certified skyscraper with direct access to the MRT-3 and LRT-2 stations as well as the Manhattan Garden City residential condominiums via an elevated walkway. Strategically located, this premier 29-storey mixed-use building has three levels of basement parking, five levels of retail seamlessly extended from Gateway Mall, a helipad, and 24 levels of premier office spaces housing mostly BPO offices, serviced by multiple telecom providers. It has a centralized air-conditioning system and 100% back-up power. 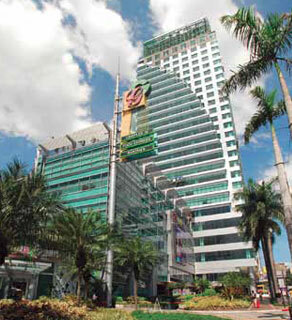 The building’s two topmost floors house the offices of the Araneta Center, Inc. Standing at the South East quadrant of the Smart Araneta Coliseum, Novotel Manila Araneta Center is a conveniently located deluxe business hotel with 400 rooms, a flexible ballroom that can cater to a maximum of 1,000 people, 8 meeting rooms, an all-day dining restaurant, and a Presidential Suite at the Penthouse level. The highlight of this 26-level building is the executive lounge with a 360-degree view of the metropolis. Apart from amenities like the swimming pool, fitness gym and three levels of parking, it has an events garden that can be used for weddings and other private affairs, and a health and wellness center. With flexible spaces that can easily be transformed to meet the business needs of its clientele, the hotel emphasizes state-of-the-art technology, natural light, and urban contemporary design. A project of the Araneta Center and Megaworld Corporation, this Mahnattan Garden City will be comprised of 18 residential high rise towers with roughly 9,000 apartments for about 36,000 residents upon completion. The ten high-rises that make up the first three phases – Manhattan Parkway (three towers), Manhattan Parkview (three towers), and Manhattan Heights (four towers) – are already 100% sold out and turned over to buyers. The last phase, the Manhattan Plaza, will feature eight high-rise residential towers. Inspired by the famous Rockefeller Center in New York, it will have a civic plaza and retail podium at the center of the development. Mahnattan Plaza will be highlighted by a set of grand Spanish steps that leads to the civic plaza. As the country’s first transit-oriented residential development, all 18 towers will eventually be linked via elevated bridgeways to Gateway Mall and the terminals of the MRT-3 along EDSA and LRT-2 along Aurora Boulevard. The whole project will also be connected below-ground via a network of basement parking. Residents have unprecedented easy access to and from P. Tuazon Street and Aurora Boulevard without passing through the Center’s road network. The P15-billion mega project, Araneta Center CyberPark, will ultimately deliver a total of 550,000 gross floor area of prime office space in an eighthectare PEZA-registered IT Zone location. 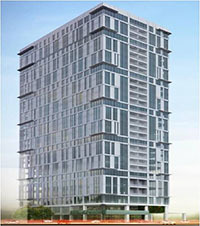 The whole complex will comprise of five high-rise towers, 2-level seamlessly connected retail podium and 3-level basement parking. The first building completed in the development is the CyberPark 1 (CP1), which has 29 levels of prime office spaces, three levels of retail, and three levels of basement parking. Compliant to the green building code of Quezon City, this 90,000 sq.m PEZA-registered tower has 100% back-up generator power, multiple telecom service providers that ensure high-speed telecom backbone access to its tenants. Office locators include Genesys, Sterling, Stellar Philippines, Inc., and Vibal Publishing. A groundbreaking ceremony was held on May 19, 2016 for CyberPark 2 (CP2) and construction is underway. This second PEZA–registered tower will have retail spaces and dining areas at the ground floor and second floor; and prime office spaces from the 3rd to the 30th floors. It will have three levels of basement parking, 14 elevators, and a roof deck. A LEED-compliant, environment-friendly building, it uses double-glazed energy-efficient windows that reduces heat penetration, and features a rainwater recovery system. CP2 is expected to be completed in 2018. 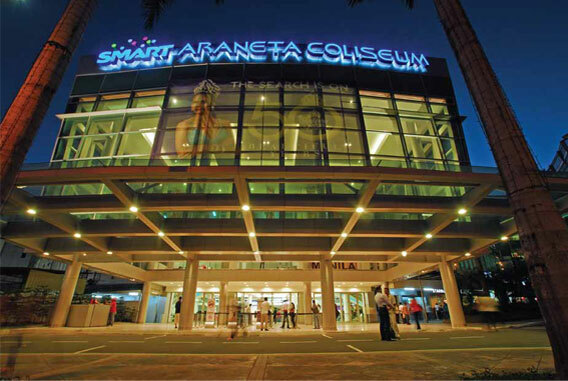 At the very core of the Araneta Center is the 20,000- seater Smart Araneta Coliseum, which caters to over 260 shows a year. March 2012 marked the start of the historic makeover of the country’s sports & entertainment mecca—the Big Dome—with the construction of a 4-storey glass curtain wall atrium at the Green Gate entrance. This will serve as the grand ceremonial entrance of the Coliseum featuring the new SMART Araneta Coliseum logo. To accommodate the technical demands of current international / foreign shows, the renovation includes improvement of back-of-house facilities; addition of safety features; new access gates; a VIP / Sports Bar; and replacement of all 20,000 arena seats. The classic 60’s entertainment landmark New Frontier Theater has been reborn into a 2,500 capacity ultra-modern theater equipped with the latest in audio, visual and lighting technologies. The New Frontier Theater is a multi-function venue that can house everything from mid-size concerts and private gatherings to conventions and seminars. The ground level seats may be taken out to accommodate more people. It has al-fresco dining restaurants and fast food joints along its perimeter. Capturing the elegance of the past and mixing it with the aesthetics and functionality of a modern entertainment venue, New Frontier Theater greets patrons with an elegant drop-off points that opens into an expansive lobby fit for upscale events. A staircase and matching escalators bring patrons to the mezzanine level, a perfect venue for meet-and-greet sessions with the stars before the show. The theater officially opened on August 15, 2015 with the Manuel L. Quezon play, which was quickly followed up by the world-renowned Disney Live. Since then, it has a steady line up of shows featuring top foreign and local artists like British girl group Little Mix, Charlie Puth, and standup comedian Russell Peters, as well as local pop stars Xian Lim and Kyla, among others. To accommodate the technical demands of current international / foreign shows, the renovation includes improvement of back-of house facilities; a museum; addition of safety features; new access gates; construction of a VIP/Sports Bar; and replacement of all 20,000 arena seats. Araneta Center is the only shopping complex with a fresh market. Featured by famous American chef, author and TV per–Bus Station: Newly renovated, this station caters to 30 provincial bus companies with up to 600 provincial buses leaving daily bringing passengers to places as far as Davao. Newly renovated, this station caters to 30 provincial bus companies with up to 600 provincial buses leaving daily bringing passengers to places as far as Davao. One of the biggest retail chains in the country, the SM Department Store at the Center is its largest outlet at 85,000 square meters. The first supercenter in the Philippines, Araneta Center is home to its biggest branch offering basic necessities at affordable prices. A fitting extension to the awarded Gateway Mall, this massive mall development encompasses one side of the Smart Araneta Coliseum. The project features state-of-theart facilities designed to give the utmost shopping experience to its clientele. Plans include a 300-room Ibis Styles Hotel, a roof deck activity area, a chapel, island restaurant-food court, and a Cineplex with private cinema lounge within the complex.